Long long ago at a table at a restaurant about 5 miles away I sat eating some chicken wings. I must have been eating them daintily because one little girl sharing the table with us told her dad that I looked like Snow White. Another little girl heartily agreed. I’m not gonna lie. I was flattered. Tremendously so. 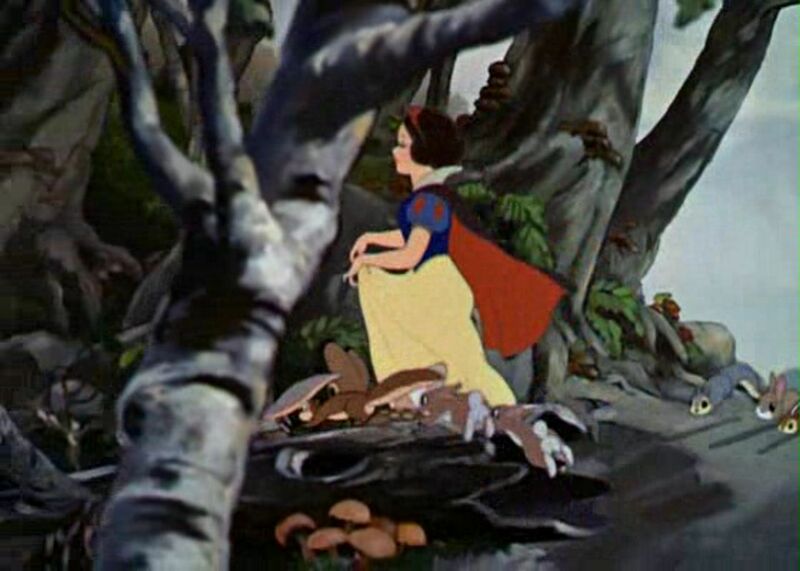 Is Snow White the princess I would choose to emulate were I in the position to be a princess? No. But I have been dying my hair black as coal for the better part of my life. I do avoid the sun or wear a thick smear of sunblock to protect my delicate skin. And I do imagine that I rock a red lip like nobody’s business. I still have a soft spot in my heart for those two, though I doubt either of them remember me or even each other. And if my similarities to Snow White ended with the black hair, pale skin, and red lip I’d probably be pretty happy. I’ve discussed before that I don’t have a need to clean up after 7 miners. And the thought of having to fear an evil witch’s poison every time I take a bite of a big juicy apple, well that’s a bit too much stress for me. I wouldn’t say I’m an animal person so much as I would say that for an urban girl I seem to have an awful lot of run-ins with animals. Now Portland isn’t really your typical urban city setting. Yes we totally have a lot of plants and trees and stuff. And those come with animals. But still. Sometimes I think I’m an animal incident magnet. Or maybe I’m just a little paranoid and overly dramatic. But at least twice a year a murder of crows will follow me on a walk. And when it’s just a crow or two about they’ll walk at my feet. Or call to me from power lines, hopping from line to line, following me all along the way. At times it makes me worry they know something I don’t know. Am I about to drop dead and they’re waiting to peck out my juicy eyes? Do they love my shiny black hair and want to line their nests with it? Am I the crow whisperer? And then there’s the occasional run-in with squirrels. Or that time a mama raccoon chased me for blocks and then I had to jump over a snake. And all the times that my neighbors dog gets out and goes straight for my door instead of hers. It’s even learned to knock so I’ll let it in. And when I was a kid and we were camping there was this one time that a squirrel who we had named Cookie climbed up into my lap, looked me right in the eyes, and then plunged her little squirrel hands right into my bowl of ramen noodles, grabbed up a big ol squirrel armful, and then shoved them into her chubby cheeks and ran away with a noodle still flapping out of the corner of her mouth. But I won’t count all the times the tiny little birds have harassed me on the patio of the Mexican restaurant down the street because I’m pretty sure they just wanted chips… but really, who knows? And then there’s the possum. Well possums. Maybe it’s because of the years I spent in Texas as a child but I seem to see possums everywhere. Hanging in trees. Skittering along the sidewalk. Sometimes squished in the road. And then there are all the times that for some reason I have imagined that there’s a possum in my kitchen. Now I know what you’re going to say, “Cami, you never told us you thought there was a possum in your kitchen.” And you know, you’re right. I’ve only written about the time I thought there was a raccoon in my kitchen. Spoiler alert: There was not a raccoon in my kitchen. To make an unreasonably long story even longer, this morning as I stood at my sliding door sipping my coffee and surveying the vine farm that is my back yard I saw a possum stumble out of the weeds in the back corner and onto the patio. It stopped on my rug for a moment as if to appreciate that someone had so thoughtfully placed an outdoor rug there for its paw comfort and then looked around. That’s when it saw me through the door. It’s tiny little black eyes looked into my sleepy blue eyes and I am pretty sure I took another sip of coffee before I fully comprehended that there was a possum just feet from my kitchen and it was staring at me. I imagine it was making the difficult choice between making friends with me, playing dead on my rug, or running for its little possum life. I don’t think it realized that I am more afraid of it than it is of me and it made a run for it into the vines that run along the side of my house on the external wall of my kitchen. The last thing I saw was its skinny little possum tale disappearing into the vines. But I could hear it. The vines were rustling as it ran on its four little possum paws. And they moved in as they pulled against its pale possum pelt. So now I can’t feed my cats in case it finds a way to get into the kitchen. And obviously I can never go in my back yard again in case it tries to make friends. Which is a shame because I really love sitting at the patio table enjoying the outdoor rug someone so thoughtfully placed under my patio table. Also, Rick will have to do all of the grilling from now on.